Seeing that emperumAn is thinking “one has to experience the result of ones sins surely”, AzhwAr requests through some swans to emperumAn “May be chinthayanthi could have exhausted her sins by experiencing [acute suffering in separation from krishNa], but my sins are too much that they cannot be exhausted by experiencing the results”. Subsequently, parAnkusa nAyaki requests some swans that have better conduct and purity than the quills to go as a messenger to emperumAn who made her fully dependent on him. In this 3rd pAsuram, parAnkusa nAyaki requests some swans to inform emperumAn “if my sins are not eliminated by your mercy, they cannot be exhausted by experiencing the results as well”. Oh swans who out of great fortune being with your female companions having tender steps (conduct)! emperumAn assumed the disguise of a dwarf celibate boy and stood begging for the world as a cheat. I am an ignorant girl who is unable to understand his acts and my mind is totally bewildered and losing consciousness – please go and tell him this. “oruththi” (a girl) will make him realize exactly who it is (since he knows who would be in this state). Through this pAsuram, the glories of gatakas (AchAryas) with respect to their tender (perfect) conduct of gently dealing with each other and their greatness are revealed. vidhi as sAsthram, and parAnkusa nAyaki says “since you are having union according to sAsthram, you are not separated from each other. But I am trying to have union with him (without being married) – that is why I am separated”. vidhi as bhAgyam (fortune) – you are being together due to your fortune or it can be said as my fortune. swans’ fortune – Being together with ones lover is the result of ones puNyam (virtues) and being separated is the result of ones pApam (vices). parAnkusa nAyaki‘s fortune – When srI rAma was searching for sIthA pirAtti, he met sugrIva who had also lost his wife, kingdom, etc. srI rAma ensured that sugrIva was well settled – then only he started to remedy his own sufferings. So, should parAnkusa nAyaki also be not happy for the swans being together? For ones who are compassionate, sufferings of others are more important than their own sufferings. pedai maNakkum – Being together with the female companion – satisfying the desires of the female companion. mennadaiya annangAL – Are you going to get my desires fulfilled with such tender walk/steps? As explained in srI rAmAyaNam kishkinthA kANdam 33.37 “sA praskalanthI…” (the famous thArA arrived with a staggered walk…). nampiLLai beautifully explains the whole slOkam here. When sugrIva was enjoying with thArA after vAli was vanquished, and forgetting to help srI rAma as committed, srI rAma sends lakshmaNa to check on him. lakshmaNa arrives there with great fury on sugrIva’s attitude. Hearing lakshmaNa’s roar at the entrance, sugrIva trembles, realizes only thArA can pacify him and sends her to lakshmaNa. That famous thAra comes out as it is after enjoying sensual pleasures with sugrIva with a staggered walk, blurred vision due to consumption of alcohol, dress in irregular manner, who looks like a beautifully bent creeper, approached lakshmaNa. nampiLLai says thArA has a motherly affection towards lakshmaNa [this is based on kambar’s view too], so just like a mother would at times appear in front of the child in “not so perfect” condition casually, thArA approached lakshmaNa. Similarly, parAnkusa nAyaki also thinks that the swans with their beautiful and tender steps, convince emperumAn and fulfill her desire. 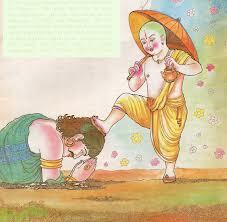 mathiyinAl – Unlike rAvaNa who had to be destroyed, mahAbali had a good quality named audhAryam (generosity). indhran lost his kingdom. Both of them should be satisfied – so, emperumAn who is glorified in srI rAmAyaNam yudhdha kANdam 21.8 as “gOsahasra pradhAthAram” (After gifting thousands of cows in charity…) – the one who has hands which are greatly known for their generosity – decided to beg. That was emperumAn‘s intelligence. kuRaL – When a huge quantity is condensed in to a small quantity (like milk boiled to get guava which is too sweet), so it can be easily enjoyed. mANAy – the form of a brahmachAri (a celibate boy) who is equally smiling to people happily giving alms and others shutting the door on him while begging for alms. ulagu irantha – Begged the world that was created by his own sankalpam (divine will). kaLvarkku – thirumAlai ANdAn explains this as a “cheat”. emperumAnAr explains it as “one who did something to accomplish something else”. emperumAnAr‘s explanation is based on AzhwAr’s thinking that “He cheated mahAbali to attract me”, since he himself said previously (1.3.10) “perunilam kadantha nalladippOthu” (this divine lotus feet which measured the huge world). AzhwAr‘s nature is such that, whatever emperumAn does, he will always be attracted to emperumAn only. He says in thiruvAimozhi 5.3.5 “ulagam koNda adiyan aRivarumEni mAyaththanAgilum kodiya ennenjam avan enRE kidakkum” (Though one who grabbed the world (from mahAbali), his forms are difficult to grasp, my heart will always be for him) and in thiruvAimozhi 5.4.10 “anRorukAl vaiyam aLantha pirAn vArAnenRu onRorukAl sollAthu ulagu” (the (people in the) world is not even saying that, the emperumAn who once measured the world will not come for you). thirumangai AzhwAr also says in periya thirumozhi 9.4.2 “munnam kuRaLuruvAy mUvadi maN koNdaLantha mannan sarithaikkE mAlAgi ponpayanthEn” (my bodily complexion changed out of great love for emperumAn on hearing the history of emperumAn becoming a dwarf, begging for 3 feet of land and measuring the worlds). All AzhwArs are thus attracted to emperumAn‘s vAmana avathAram. mathiyilEn – ignorant. I should have simply requested him when he was leaving – I was not even intelligent to do that. valvinaiyE mALAthO – parAnkusa nAyaki is called dhIrga chinthayanthI. chinthayanthI was a gOpi who was once caught in a situation at her house where her in-laws were at the hall-way. She heard the flute music of krishNa and wanted to go to him at once. Her virtues were exhausted by constant/deep meditation of krishNa at that moment. Her vices were exhausted by suffering in separation and not being able to leave at once. Since puNyam/pApam were nullified, she at once gave up her body and reached paramapadham. But AzhwAr, goes through these emotions repeatedly and constantly – that is why he is glorified as dhIrga chinthayanthI. oruththi – a girl. How will emperumAn know that it is about parAnkusa nAyaki? Like a deer is hunted down by a hunter’s bow, and if it was told to the hunter that “in such and such place, a deer is hunted down”, the hunter will easily identify that it was his hunt – similarly, emperumAn will know that only parAnkusa nAyaki will be suffering so much in separation. oruththi – most distinct . She is different from samsAris (who are simply focused on material aspects), nithaysUris (who never have separation from emperumAn) and other AzhwArs (because they are nammAzhwAr‘s avayavam (parts)). mathi kalangi -Tell him that she is bewildered. He will say “even if her knowledge is diminished, I have given her (special) knowledge”. mathiyellAm uL kalangi – Tell him “The unblemished knowledge you gave is totally lost in her and she is fully confused”. mayangumAl – Hearing that, he may say “Oh! Is that so? I will give her knowledge when I go there”. If you said “she has already died”, he may think “What is the use of going there if she has died?”. So, tell him “She will die soon if you don’t go”. ennIrE – You do your duty of informing him – if he does not come it will be his fault. When he hears your tone, he will understand my suffering and come to me. This entry was posted in thiruvAimozhi, thiruvAimozhi 1st centum on July 14, 2015 by Sarathy Thothathri.